On May 16th, we welcomed back the STEM Shuttle, operated by the Dream Flight USA Foundation, along with the 5th graders from both Westfield and Montello Elementary Schools. 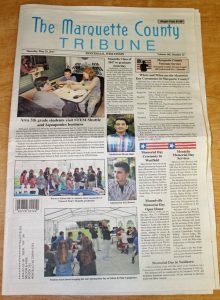 Our sponsorship to the STEM Shuttle allows us the opportunity to annual host a field trip for nearly 90 local 5th grade students, where they get to spend their day participating in hands-on activities aboard the STEM Shuttle and tour our state-of-the-art aquaponics greenhouse facility. Oh my, what a marvelous May, bursting with blossoms, events and opportunities. Looking out my window, the lake is a brilliant blue, contrasted by myriad shades of green on the freshly leafed trees. Bright sunshine illuminates the splash of jumping fish and the scent of lilacs fills the air. Our May started with a trip to Minnesota for the University of MN Aquaponics Symposium on May 2. Rebecca Nelson was both a keynote speaker and panelist at this event. A few days later, we hosted a planning meeting for DATCP (WI Department of Agriculture, Trade and Consumer Protection) at our education and training greenhouse facility in Montello. 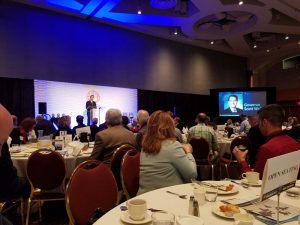 On Thursday, May 11, Nelson and Pade, Inc.®, along with a handful of other thriving Wisconsin businesses, was recognized as a finalist for the Governor’s Export Achievement Award at the Wisconsin International Trade Show in Milwaukee, WI. Rebecca attended this event, which showcased opportunities for Wisconsin business in the Export Market. The conference was a very positive experience; one that will help advance our vision of food security for all nations by creating innovative pathways for our company to facilitate the success of new aquaponics projects around the globe. On the same day, May 11, the Nelson and Pade Team welcomed Dr. Myron Kebus, WI State Aquaculture Veterinarian, and his students for a tour of our facility and the UWSP-Aquaponics Innovation Center with Dr. Hartleb. It is always a pleasure to have Dr. Kebus visit. His students were fascinated by aquaponics and the possibilities it creates for the study of fish in veterinary science. On May 12, we offered our ½ day Aquaponics Seminar in Montello. Sixteen attendees spent their Friday afternoon learning about aquaponics. This is always a popular training session which highlights the benefits and methods of aquaponic food production as well as introducing attendees to Nelson and Pade, Inc.® and the aquaponics industry. It was a nice surprise to open the Spring, 2017 issue of WI Academy of Science, Arts and Letters magazine, released in mid-May. It focusses on Wisconsin People and Ideas and Nelson and Pade, Inc.® is featured in an article written by Nivedita Sharma. On May 16, we will welcome back the STEM Shuttle, operated by the Dream Flight USA Foundation. The STEM shuttle is a mobile classroom in which students learn how to design a space station, operate a robotic arm and study star maps, among other things. Nelson and Pade, Inc.® is a sponsor of the STEM shuttle, providing funding for continued STEM shuttle visits and integrating a work station on feeding people in space with soilless food production. When the STEM shuttle arrives at our business campus, we will host nearly 90 local 5th grade students and their teachers for activities on the STEM shuttle, aquaponic greenhouse tours and lunch. Rounding out our training for May is a one day Business and Investment Opportunities in Aquaponics Class followed by the Lab sessions for the University of Wisconsin-Stevens Point Introduction to Aquaponics course, co-taught by Dr. Chris Hartleb, Rebecca Nelson and John Pade. In addition to all of that, our Team has been busy fulfilling orders for Clear Flow Aquaponic Systems®. In May, systems were shipped throughout the US as well as to Malawi, Africa. A large commercial systems is ready to be shipped to Creekside Farms in Neenah, WI. The last few days of May will be restful and as we prepare for June, which includes a 3-day Aquaponics Master Class®, participating in the prestigious Wisconsin Manufacturing Extension Partnership’s EXPORTECH program and advancing Nelson and Pade, Inc. License Agreements with Green Relief in Canada and Aquaponics Bulgaria, Ltd., who will represent us in Bulgaria and the Balkins. “Rebecca Nelson always had a passion for raising fish; by the time she was ten, her family’s home was filled with aquariums. Her partner, John Pade, grew up on a dairy farm, learning a lot about livestock and agriculture. The two combined their skills and interests in 1984 when they founded an aquaponics company called Nelson & Pade Inc. Located in Montello, the company today creates new aquaponics technologies and systems while generating sustainably raised food for the Central Sands Region. It also provides training and support for aquaponics growers worldwide. Aquaponics combines aquaculture (fish farming) with hydroponics (soil-less plant growing) through an integrated system. Large tanks hold fish that are fed pellets or other protein-rich food. As their water is refreshed, the old water passes through a biological filter and on to trays of growing media (usually a fine gravel) for plants. In the trays, nitrifying bacteria convert the waste ammonia from the fish into the nitrates vital for plant growth. The growing plants remove more and more of the nutrients, filtering the water until it is clean enough to return to the fish tanks. Last week we hosted another 3-day Aquaponics Master Class® at our campus in Montello, WI. Our experienced and knowledgeable instructors, along with our state-of-the-art training facility and comprehensive course presentations, draws attendees from all over the world. Aquaprenuers from as near as Sun Prairie, Wisconsin and as far as the Philippines joined us April 27-29 for dynamic classroom lectures and hands-on greenhouse sessions. Our April 2017 Aquaponics Master Class® reconfirmed the global impact that Nelson and Pade, Inc.® has as we welcomed an attendee from our 102nd country. Farrukh Usmani of Karachi, Pakistan travelled all the way to Montello, WI to learn more about this sustainable form of agriculture. Farrukh has been operating an aquaculture farm in Karachi for the past two years and would now like to get into a commercial aquaponics operation. As the leaders in the aquaponics industry, he came to our course looking to get started and discuss the day to day operations to make his transition successful. To date, we have now hosted attendees from 102 countries, spanning 5 continents, and all 50 U.S. States and 3 U.S. territories at our 3-day Aquaponics Master Class®. You can read more about this highly sought after offering and view our upcoming offerings on our website. Farrukh Usmani, April 2017 Aquaponics Master Class® attendee, places on pin on our attendee map. His pin in Pakistan marks country #102.